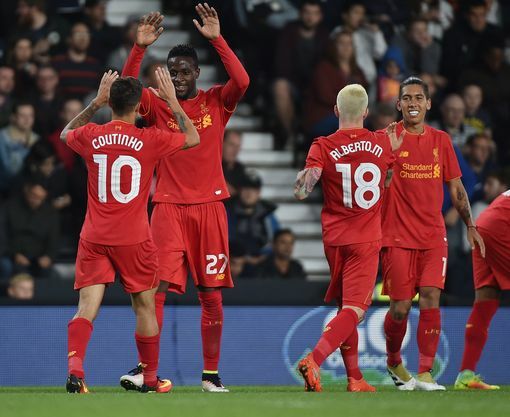 Liverpool breezed into the fourth round of the EFL Cup with a convincing 3-0 victory over Derby County. Jurgen Klopp’s men looked full of confidence after dispatching Chelsea onFriday Night Footballand were in control the moment Ragnar Klavan opened the scoring in the first half. Philippe Coutinho and Divock Origi were both a class above the Derby defence and they helped themselves to a goal apiece after the break. Jurgen Klopp made seven changes to the team that dispatched Chelsea 2-1 on Friday Night Football, including handing a debut to goalkeeper Lorius Karius and a first start for Marko Grujic. Derby also gave a goalkeeper a chance to impress with 21-year-old Jonathan Mitchell making his debut as Nigel Pearson made five changes from the team that drew 1-1 with Bristol City on Saturday. The Rams have only taken six points from their first eight games this season and looked nervous in front of their home fans. Liverpool got into their stride very quickly. Jordan Henderson, buoyed by his goal of the season contender against Chelsea, flashed an early volley over the crossbar before Roberto Firmino followed suit on seven minutes. Derby were struggling to really impose themselves on the game yet were seemingly dealing with Liverpool’s threat – until Richard Keogh went to sleep on 24 minutes. The Derby skipper scuffed a clearance following a Phillipe Coutinho’s corner and the ball dropped straight to Klavan, who couldn’t believe his luck from six yard and he poked in his first ever Liverpool goal. Keogh’s confidence looked shot to pieces after the goal. Divock Origi twisted his way past him in the area three minutes later but Mitchell came to the rescue with smart save at his near post. Pearson tried to get his team on the front-foot by bringing on former Liverpool man Tom Ince for defender Chris Bair but Liverpool were in no mood for relenting. They doubled their lead on 49 minutes – a goal very much made in Brazil. Firmino forced the Derby defence back towards their own goal and it opened the space for Coutinho, who received the pass from his teammate and slotted home from 12 yards. Two became three five minutes later. Coutinho went from scorer to provider this time as he released Origi in behind Keogh and the Belgian ruthlessly powered an effort into the roof of the net from a tight angle. Although he was picking the ball out of net on regular intervals, Mitchell made some impressive saves on his full debut, the pick of which came on 61 minutes to deny Firmino from close range. With the game petering out, Klopp shuffled his pack and handed a debut to 18-year-old Ovie Ejaria, who was named on the bench against Chelsea. The Reds saw the game out comfortably in second gear. Klopp’s men look firmly in the mood to go one better than last year’s runners-up spot in the EFL Cup.